What is the Pikolo carrier? Babywearing Wednesdays – What is the Pikolo Carrier? 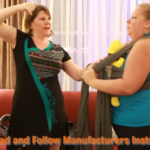 In this episode we talk with Arie, from The Canadian Babywearing School on the Pikolo carrier and the benefits to using it.